Double Exposure Investigative Film Festival and Symposium announced on Oct. 4 the complete film program of its third edition, featuring world, U.S., and Washington, DC premieres of new documentary films that go beyond the headlines to capture riveting stories and confront matters that have been hidden from the public, until now. 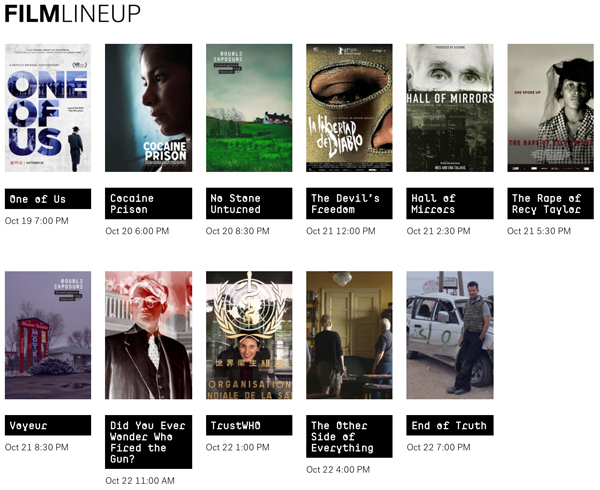 The eleven films in this year’s program, running from October 19-22, represent the largest and most ambitious lineup yet. With the titles announced today, Double Exposure has quickly become Washington’s premiere fall festival for films at the intersection of investigative journalism and visual storytelling. With screenings in the evenings and weekend, the film program is intertwined with a daytime symposium bringing together leading investigative journalists, film directors, producers and funders. Symposium topics this year include panels on “the real take” on fake news, protecting sources and subjects in newly hostile environments, immersive and undercover reporting, and conversations with leading filmmakers. “The films in this year’s lineup are not only great works of journalism, but great works of cinematic storytelling that bring vivid and distinct focus to a range of topics and issues otherwise left unseen,” Sky Sitney, Double Exposure co-director, said. Oct. 20 – 6:00 p.m.
Oct. 21 – 12:00 p.m.
Oct. 22 – 11:00 a.m.
Oct. 22 – 7:00 p.m.
Oct. 21 – 2:30 p.m.
Oct. 20 – 8:30 p.m.
Oct. 19 – 7:00 p.m.
Oct. 22 – 4:00 p.m.
Oct. 21 – 5:30 p.m.
Oct. 22 – 1:00 p.m.
Oct. 21 – 8:30 p.m.